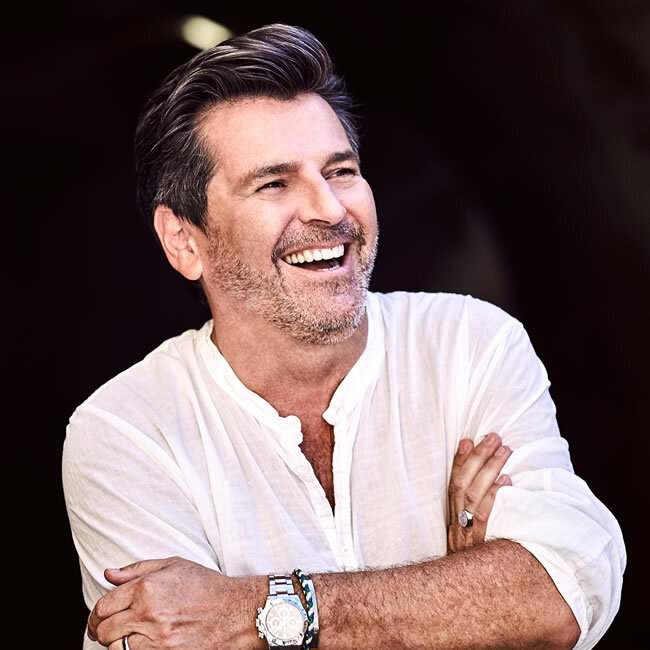 THOMAS ANDERS was born on 1 March 1963 and is one of the few German stars who has made both a national and international impact on music history. During his immensely successful run with Modern Talking, he had countless chart hits, which made him famous in almost every corner of the earth. “You’re My Heart, You’re My Soul” alone reached No.1 in 81 countries. Worldwide CD sales of Modern Talking and of Thomas Anders’ solo works have now topped the 125 million mark. Thomas Anders has received more than 420 gold and platinum records and numerous awards for his artistic achievements, including the “Bambi”, the “Goldene Europa”, the “Goldene Kamera”, the “ECHO”, the “World Music Award”, the Golden and Silver “Bravo-Otto”, the “Golden Lion” from Radio Luxembourg and many more. Despite his triumphant success, Thomas Anders is constantly looking for a new challenge. As a serious and professional entertainer he does not stand still. The worldwide success he enjoyed with Modern Talking was followed by the release of many solo albums in Germany and abroad. His most recent solo pop album “STRONG” sold over 1.000.000 copies in Russia alone and immediately went platinum. In his most spectacular music video “Stay With Me”, a solo track from his album “STRONG”, he performed in the role of James Bond in true 007-style. After releasing more than 25 albums, Thomas Anders fulfilled his long-standing dream to record his first Christmas album in the style of an American Songbook. Just like its architect, “Christmas for You” was a multi-faceted kaleidoscope. New, yet traditional and international yet private, this was a work that reflected the very essence of the artist himself. In 2016 Thomas Anders followed up with another successful album. HISTORY pays homage to his time as part of the most successful German pop duo ever – Modern Talking. The album follows the wishes of many fans and reflects his live concerts from all over the world. In spring 2017 came a big surprise! Thomas Anders is to sing in German. After singing in English for so many years, Anders had to focus on doing the same from scratch in his native language. He dealt with important phonetics and asked himself the most important question: Where do I stand with my age?! In working together with his producer Christian Geller, Anders has found a way to deliver his new and catchy pop songs to his audience in an authentic and convincing way. After 40 years in the music industry, Thomas Anders continues to excite and enthuse the music world as a solo artist. His fans cherish his fascinating charisma and the stylish intimacy he shows in his concerts. They love the feeling and mood he comes across with in his songs. To this day Thomas Anders remains the only international star to have performed twelve times at the historic Kremlin in Moscow, the Russian equivalent of the Royal Albert Hall. It goes without saying that he sold out on each occasion. Thomas Anders is a star who is able to present himself in a number of different ways. From powerful concert performer to confident show presenter, he is equally at home at galas or soirées where he is known for his elegant and personable appearances. He takes his audiences on an impressive musical journey through time by presenting the countless hits of Modern Talking and many other world famous pop classics. Yet no matter where Thomas Anders performs, he will always be “The Gentleman of Music”. Thomas Anders has established himself as his own brand. He is often invited to give speeches at business and marketing academies where he gives his expertise on how to build a successful career and work on corporate branding based on his own experience. Exemplified by the release of a book “Der Mensch als Marke” which can be translated as Human Brands, he is a living example of image building. Despite his huge popularity and all the opportunities that came his way, one thing has never changed – the deep connection he has for his homeland. Although he has traveled the world, the city of Koblenz, where he has lived with his wife Claudia and son Alexander for many years, remains the absolute center of his life and the source from which he draws strength to achieve great and continuing success. As a down-to-earth “Koblenzer”, he knows how to use his celebrity status in just the right way and has been acting as patron of the “Koblenz Child Protection Association” since 2008. He very much enjoys working with and for children. Although he is constantly receiving enquiries from all over the world to support other good causes, the Child Protection Association in his home city remains particularly close to his heart.